A basket full of bread, cheese and a bottle of wine. The recipe to make me happy! I never thought I could have so much fun discovering things to do outside Barcelona, Spain. A trip that made me realize that although Barcelona is one of my favorite cities in the world, there are many interesting things to do outside the town. 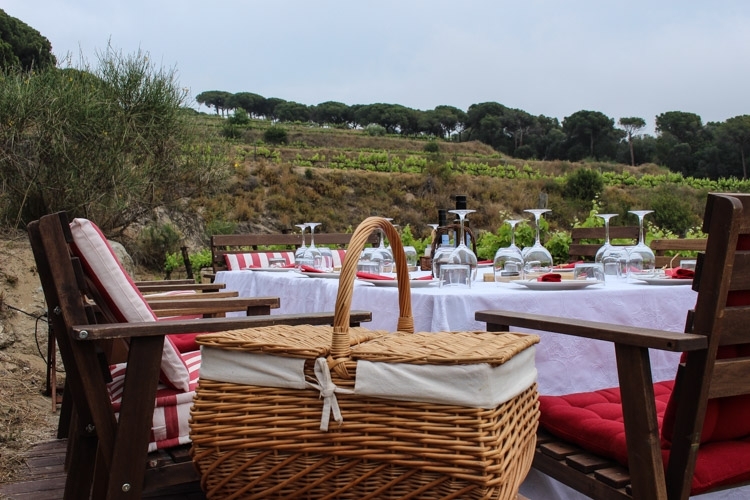 The picnic was one of the highlights of my trip to the Catalan region. For the first time in one year travelling around the world, Rob and I split and travelled alone. It was an interesting experience, like having a tiny holiday from our relationship. After the TBEX, our first travel blog conference, I let him alone at the Spanish Pyrenees and went to explore great things to do outside Barcelona. 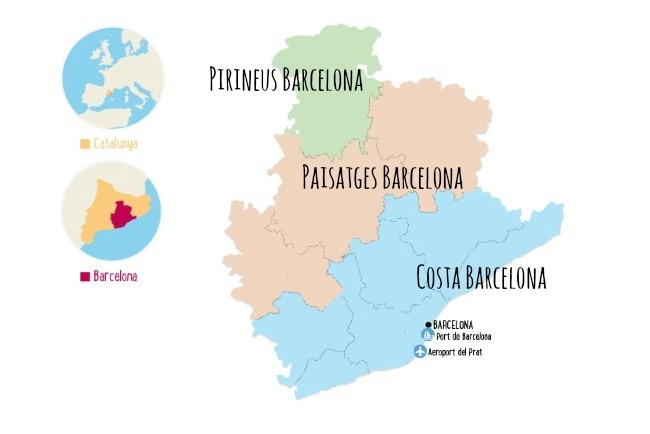 I had the chance to know a little bit of those three areas and I was surprised by the number of activities and things to do outside Barcelona. 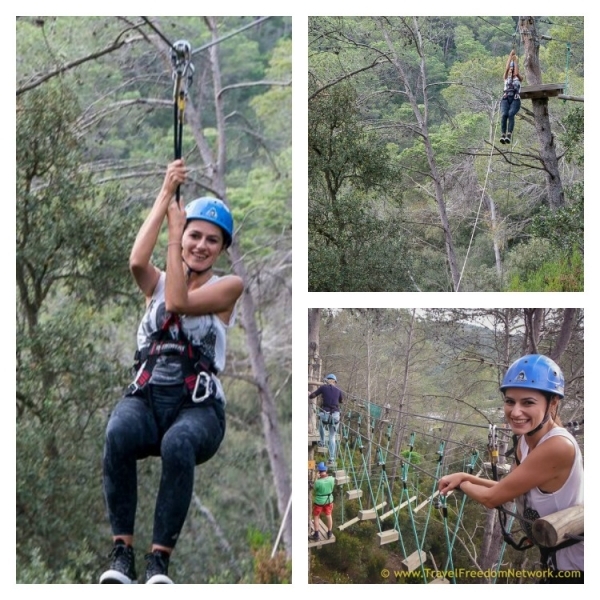 Our trip [I say ours because I was travelling with a group of bloggers] started in Lloret de Mar and finished in the heart of Barcelona. Three busy and lovely days! 1º Element » Earth – Time to explore amazing places! 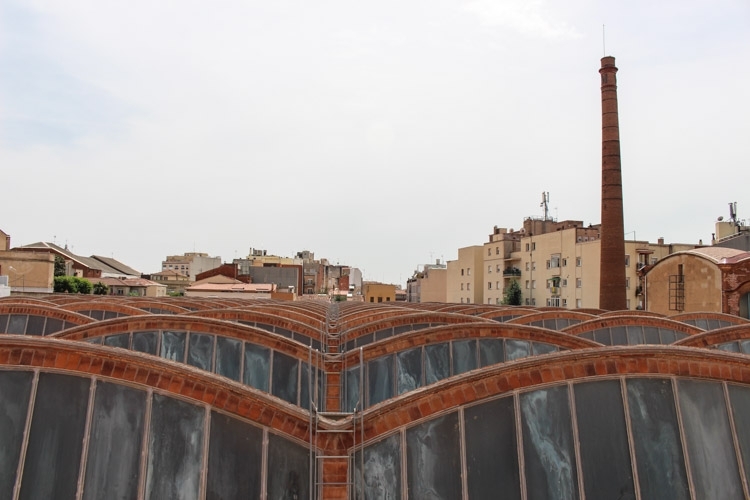 Terrassa city is located in the region of Barcelona Landscapes, and it is an open air museum with building from the Spanish industrial period mixed with stunning Catalan Art Nouveau. The impressive Aymerich, a former textile industry and now the museum of science and technology is a place you should visit. Half a day is enough to walk around Terrassa, you can explore the city by yourself or hire a guide at the tourism center. For lunch go to the rooftop restaurant at the Aymerich building! Stunning view! Time to meet some locals and work in a cooperative farm. 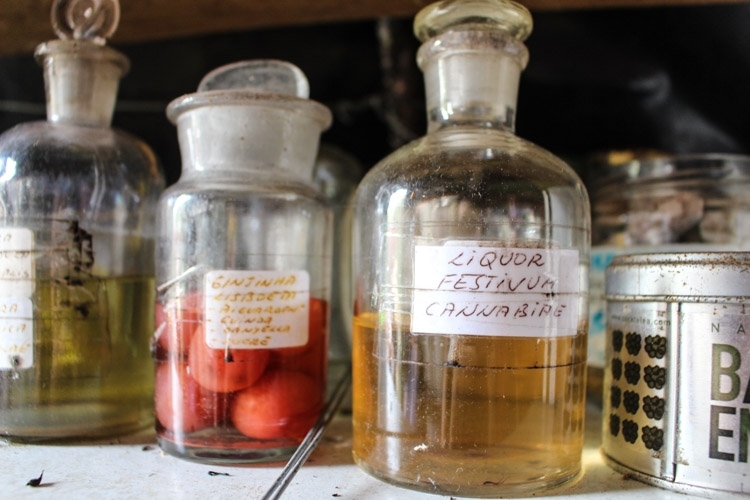 In El Pla de Grau [the area in Malgrat de Mar where they produce vegetables] the Professor Alberto Tuner taught us about medicinal plants from all around the world, and we could even have a sneak peek in his secret lab. After a long walk through his garden, we harvest some parsley and chat with farmers. Josep Turon tried to teach me how to cut the parsley, but I sucked… hahaha… I´m sure the bunch I cut didn´t make to the local shops. 🙁 Definitely not a “traditional” tourist attraction, but a way to meet Catalan people, to understand their passion for the land and culture. It was my first time riding a Segway and I had a blast. 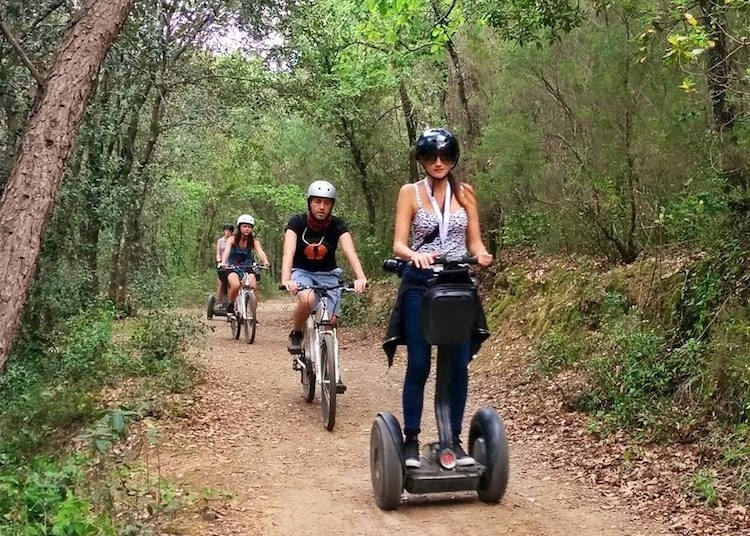 The Daema Aventura team took us for a ride at the Natural Park of Montseny [a Biosphere Reserve] and it was great fun. We drove around trees and fields until we reach an artificial lake. PS: Be really careful driving a Segway. The company gave us all the instructions, helmets and we were with guides all the time, even though one of the girls felt from the Segway and hurt herself badly. Of course the guys gave her all the support after the accident, that´s how a serious tourism company should act. The thing is that accidents might happen during a holiday trip that´s why we always have to have a Travel Insurance. No doubt this was the highlight of all the things I did outside Barcelona. 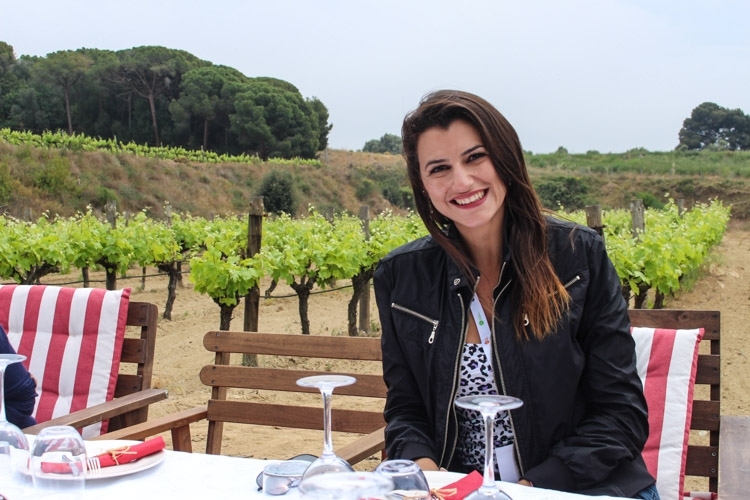 In a tiny town called Alella, on the top of a mountain, close to the sea, we visited Bouquet D`Alella vineyard and met the lovely people who run the company. We learned about the grapes, walked around the sexagenarian vines and finished the tour with a serious wine tasting. By this point I was already happy with our visit, the organic white wine was delicious [the owners make sure the wine is produced in the same way as their ancestors]. Suddenly they gave us with some baskets full of food, some wine, and a map. Our lunch was a picnic organized in the middle of the vineyards. So we played Red Hood and went through the trees searching for our spot. A few minutes later and we arrived at this beautiful table surrounded by green, with an amazing view [even the sun started shining and the cloudy weather gave us a break]. I was astonished, all the details, everything perfect, they even put an espresso machine there for us. OMG!!! Not to mention all the wine, wish I had space in my luggage to bring some bottles to fill up my wine fridge at home. 2º Element: Air – Let´s Fly! First of all, congratulations to me! I did 10 looonnngggg zip lines with almost 800m of wires set at 8 to 10 meters above the ground. I put my fear aside and I went for an amazing canoping adventure, jumping between trees, climbing ropes, and flying around. Like a happy monkey! The guys from Active-Natura gave us all the instructions, taught us the technique and rescued us in some bad movements. I felt super safe. Teamwork, fun and I`ll definitely going to do it again! Costa Barcelona has a stunning coastline, 100 kilometers of beaches and cities for all styles of travelling. 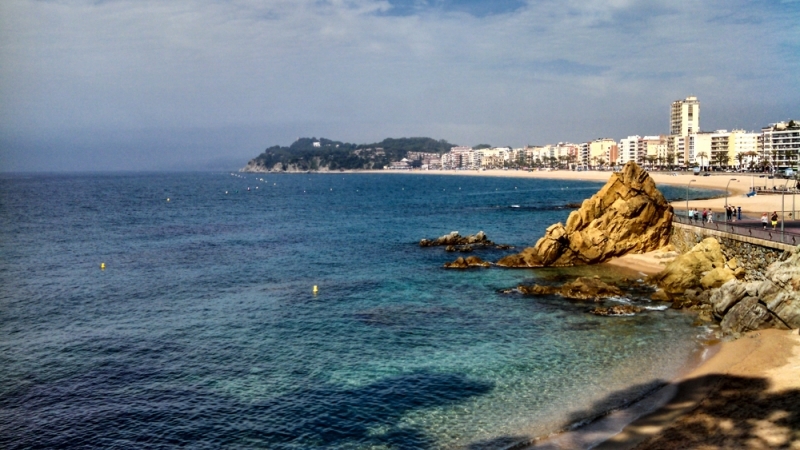 Lloret de Mar is perfect for young people full of parties, bars and boat trips. Malgrat de Mar and Calella are famous as family destination. Among many things to do outside Barcelona, the water sports are the top attractions, that´s why some cities have tourism centers focused on it. The sea lovers can find the water sports advisor centers in Santa Susanna and in Vilanova i la Geltrú. And for those who love the sea view, the coastline paths and trekking routes are open in almost all the seasons. When we talk about water and things to do outside Barcelona most of the people think: Beaches. But I will show you another way to have fun: pools, hot tubs and sauna. Heaven!! Not so often I have the chance to indulge myself in a Spa, so I put my bikini on, I grabbed my towel and run to the Spa at Hotel El Montanya. Sorry, but I have no picture of the Spa! For the first time on the trip I forgot to be a blogger, I left my camera in the room and just chilled out as a normal guest. I´m sure you are curious about our fourth element. It’s not so common to enjoy a trip with fire, or on fire, but with Love and Road unexpected things happen! We went to Vic city, really close to the Pyrenees to fly a hot air balloon. The take off was in the middle of the fields, we flew above the city, admired the Pyrenees mountains [still with some snow caps] and helped our pilot to land and fold the hot air balloon. A really unique and adventurous morning. The Baló Tour does group and individual flights. As Vic is in a valley, protected from strong winds, they can fly almost everyday and the landscape is stunning. 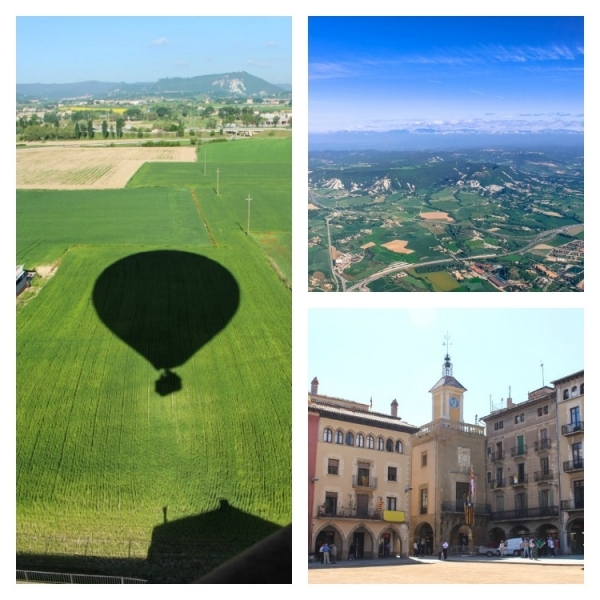 The balloon flight is definitely one of the hottest things to do outside Barcelona. After the flight, we went to explore Vic, a historical town with medieval architecture. Still talking about fire, we can´t finish our 4 Elements Adventure without eating a feast. All our meals in Catalunya were delicious, but the last lunch was “oh my God!!”. Eating at Magda Subirana Restaurant is definitely is one of the top recommendations of things to do outside Barcelona. Magda, the chef, will surprise you with local ingredients, reinvented recipes and good wine. A curious thing about Spanish cuisine is that most of the awarded restaurants are outside the big cities. So one thing you can be sure, you gonna eat very well while exploring Catalunya and searchings for delicious things to do outside Barcelona. There are many options of accommodation in the city and outside Barcelona. In our three-days trip we slept in two different hotels and I highly recommend both of them. Near the Calella Beach, we stayed at Camping Roca Grossa, in a super cute bungalow with three bedrooms, kitchen, bathroom, living room and even a balcony with BBQ place. Seriously, I could live there! The camping also has spaces for tents and campervans, you can choose the best option for you. I would say that the little houses are perfect for a family holiday or a friends trip. You can fit 6 people in the bungalow with comfort and privacy. Our second suggestion is the Hotel El Montanya at the Montseny Park. Famous for being a hotel base for soccer teams as Barcelona and Real Madrid, the hotel has spacious rooms, top-notch restaurants and a Spa. Do I need to say anything else?! Book a night there for a romantic trip or a business conference, but stop everything you might be doing around 8 pm and sit on your balcony to enjoy the sunset in the mountains. Traveling on a budget? Check out some backpacker accommodation in Barcelona and around. How to get around Barcelona Province? You can arrive in Catalunya flying to Barcelona or Girona airports. Long haul and local low-cost airlines fly to there. To guarantee the best prices and routes check Skyscanner.com. From the airport you can get trains and buses go to all the cities in the province. However, if you really want to discover the amazing landscape and things to do outside Barcelona I recommend you to go there by train. That is what we did, and it was a unique experience!! With our Eurail Pass we could choose any train we wanted and do all the connections we could imagine. From Barcelona to tiny cities or to busy beaches, there is no easier [and better] way to travel around. 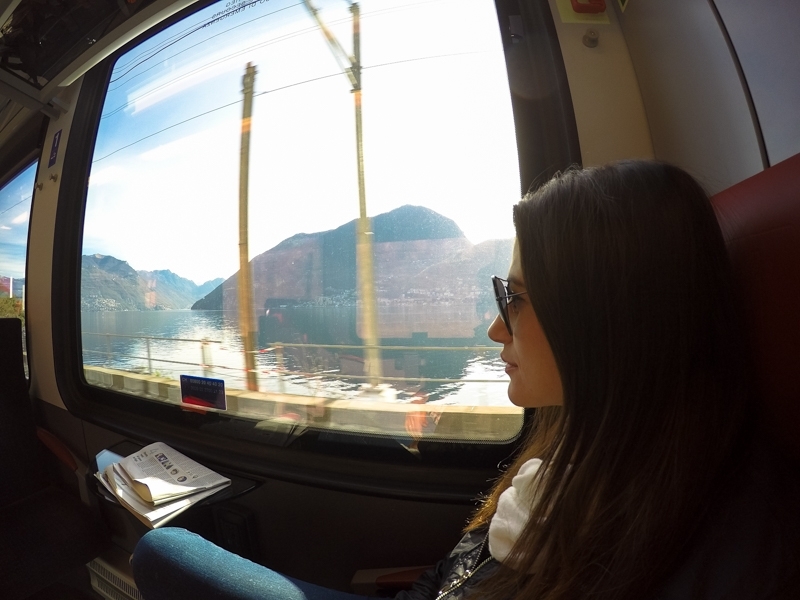 Eurail has several options of passes , I´m sure you will find one that suits you perfectly. 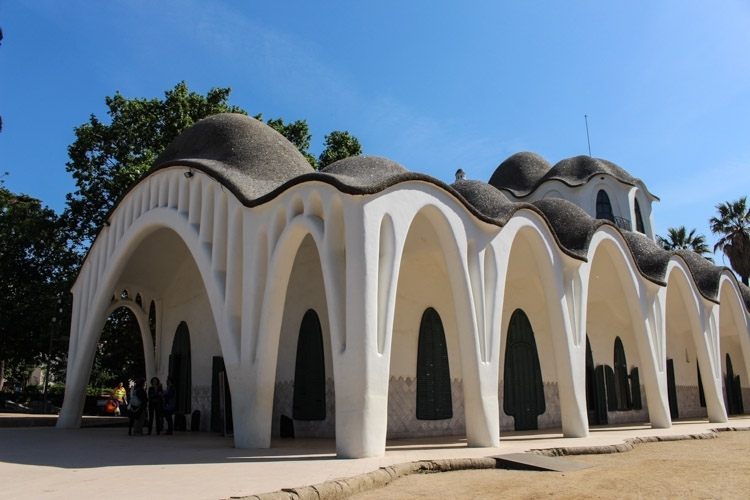 Earth, Air , Water & Fire… Four different ways to explore Barcelona Province. I had the opportunity to discover incredible things to do outside Barcelona and get in touch with Catalan people. It’s not every day that we can explore places outside the traditional tourist route, that´s why I want to say Thanks to Deputació Barcelona, the tourism office, our guides and TBEX for putting together such a great trip. After this trip I realized that I love Barcelona and all the region much more, I discovered te Province is more beautiful, warmer and hospitable than I imagined. It was a pleasure to discover that Barcelona is much more. And doesn´t matter who paid the travel bill my opinion and feelings are always true. I had a blast during my 4 Elements Trip, and I recommend to you to do the same! Go, discover the city and the unique things to do outside Barcelona, I´m sure you will love it! I could also make due with a glass of wine and a basket of bread! I bet there are so many amazing things to do outside of Barcelona. Thanks for introducing us to a few of the best ones! 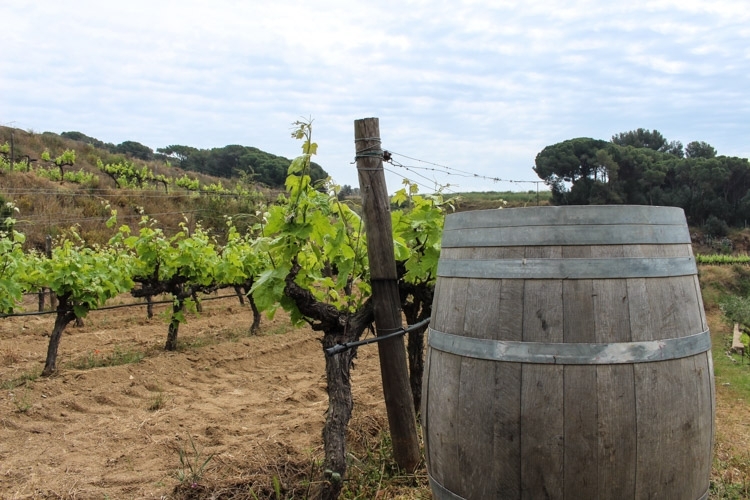 We should make a wine trip to Barcelona Province, they have two regions that produce fine wine…. And again that will be just a few of the amazing tings to do around there! 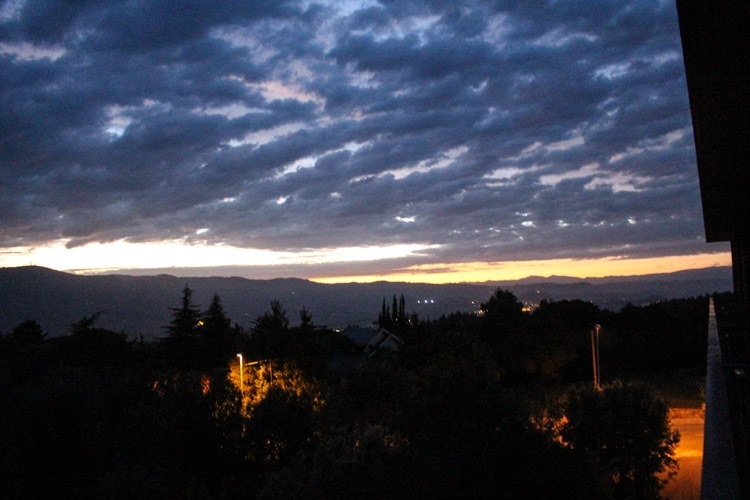 I love love love Spain, and everything about it. The food, the people and the culture. You look like you mad the most of your mini break!! Excellent Guide! It will be very handy when we finally visit Barcelona maybe in 2017! If you go to Barcelona promise me you will stay around there at least two weeks, there so much to see and do, specially in summer time! 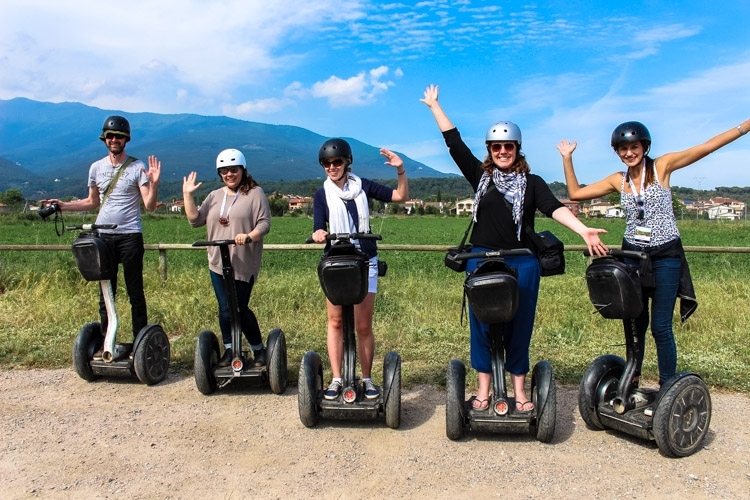 Natalie, thank you for sharing your recommendations for great options around Barcelona – I love the look of the Segway tour – I have previously done a Segway tour in the USA and it was a great way to get around! There is so much to explore in Catalunya. One could spend a lifetime, and we do plan to return again. Your post has some great ideas to get people thinking beyond Barcelona! We will take note of your recommendations. I´m glad you liked the recommendations. I am from catalonia and I really enjoyed reading your article, I totally agree there is much more to discover in Catalonia. I encourage you all to come back soon!! thanks! Have only been to Barcelona. Would have loved to spend more time there and take trips outside the city. Was only thinking about Montserrat before but now I have plenty more places to consider, thanks to you. Where was the 2nd photo taken in, by the way? Would love to take photos of landscapes like that too. Catalunya is much more than Barcelona and Montserrat, the region is full of stunning places. The 2nd picture was taken outside Vic city, where the hot air balloon took off! The wine tasting and picnic sounds perfect. I’ve never been to this area of Spain. Thanks for the tips! I’m a big enthusiast of Catalunya so if ever need more info give us a shout! If you have the opportunity to visit Catalunya go for it, it’s stunning! Discover the region of Barcelona is totally worthy! I’m sure you will love it! I hope you didn’t cut your fingers with that great big looking knife! And sorry to hear about the girl falling from the Segway – as you said, that’s what travel insurance is all about though. As you said if any accident might happened I was covered by a good travel insurance! Wow! Fantastic list of fun things to do! We started our Spain journey in Madrid and went south. Next time Barcelona and this list will be our guide! Madrid and the south are amazing too. But What I love about Catalunya is the culture and how things are lively there! Go and check it for yourself, I´m sure you will love it! You could have sold me on that alone! The balloon ride also looks divine (I love how peaceful it feels when you’re floating in one)! The break was an interesting experience!! In other hand, I had so much fun with friends and that a great experience too!!! Awesome post! Would definitely love to try that segway mountain riding 🙂 I didn’t even know that was a possibility haha.. what a great idea! Such an amazing post Natalie! I’m Portuguese and I just love Spain and everything about it. You should come visit Portugal. I bet you would love it! E agora é que me lembrei que posso comentar em português também. Haha. Tenho seguido o vosso blog no Facebook e estou a adorar as fotografias. Continuem! Que bom que você está curtindo o Blog e o Facebook, fico feliz demais!! A ideia é voltar para Europa ano que vem no verão, quem sabe damos uma psaadinha em Portugal!! Hey Nat! I love how much you were able to do in 3 days!! I was able to spend a few days in Costa Brava many years ago and absolutely loved it. Oh! And next week I’m going on a hot air balloon ride, I’m so excited! 3 super busy days, but I loved every minute. Catalunya and Barcelona is such an amazing place to be. Enjoy every minute of you flight. It´s so smooth, you feel nothing while flying. Great experience! Enjoy! So glad that you liked the post, I had an amazing time in Catalunya and really want to inspire people to visit this part of Spain. Barcelona is such a fabulous city! I’ve had the pleasure of exploring it, but not the outlying areas. Lucky you! I looks like you had a blast! Wow, every photo was spectacular and represented another reason to go visit these sites. thanks for doing your research and finding some fun and beautiful things to do! Great post! I love the exploring you did. Most people move up and down the coast but they rarely ever venture away from the coast to explore Terrassa, etc. What would you say was your favorite part of your visit? It´s hard to say which one was my favourite part, but definitely the food was one of the highlights. From the breakfast to the dinner we eat great food and amazing wine all the time. Also, I really had fun doing the canopying, it was my first time and I had a blast! Great post Natalie – there’s so much detail in it! When you make to Barcelona let know, I would love to have your opinion on this amazing city! Myself i was in Barcelona for the weekend and i really enjoyed it! I wrote my experience on my blog http://citytriptips.com/citytrip-barcelona/ but next time when i visit Spain i will use your information to book a good trip! Barcelona is a great city, isn`t? What a cool experience, thanks for sharing it!! Eating with locals, yummy!! Hello, I found your post on FaceBook, Urban Travel. So many useful information and links, just perfect for one, like me, who’s never been to Barcelona or around. That is for sure an interesting area to visit, especially for the wine, 🙂 Thanx for sharing. You are welcome, glad to hear that you liked the post and our travel suggestions. Barcelona is a stunning city and region, worth to visit! Thank you!! We will, for sure! Best regards! Your blog about Catalunya is super! The pictures, and most of all having all the fun. Thank you for sharing. 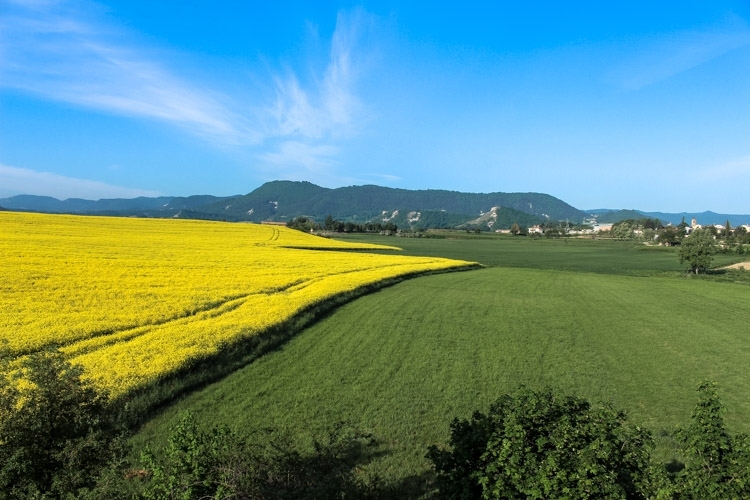 Catalunya is a special place, full of attraction, beautiful nature and good food! We love this post. Each single place, shows the friendly face of Barcelona. I had so much fun exploring this different side of Barcelona, and specially meeting the local people! Great Posts! thanks to sharing the Barcelona adventures. Thanks for stopping by, I’m happy you liked the post! I will surely be visiting Terrassa in the upcoming month. I am a huge architectural lover. Thanks for this amazing post. Terrasa is beautiful, such a unique city! Stunning! Thanks for all these ideas. I live in Barcelona and blog about it full time, but I hadn’t heard of some of these places nearby. Will have to check them out this summer. Happy travels!